THE LINUX STUFF: Configure linux printer server step by step guide and Printer Sharing Configuration. Configure linux printer server step by step guide and Printer Sharing Configuration. Raw (Model) printer named printer1 is installed and shared on 192.168.0.254. You should install the shared printer on your PC to connect shared printer using IPP Protocols. 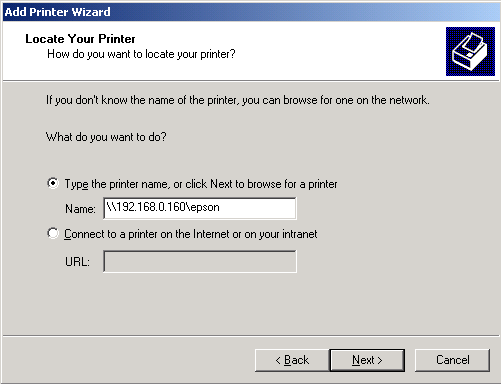 Raw printer named printerx where x is your station number is installed and shared on server1.example.com. Install the shared printer on your PC to connect shared printer using IPP Protocols. Your server is 192.168.0.254. Before you can use any printer, you first have to install it on a Linux system on your network. simply open up /etc/cups/cupsd.conf and allow access to the server by modifying the location lines. After making modifications, restart CUPS. 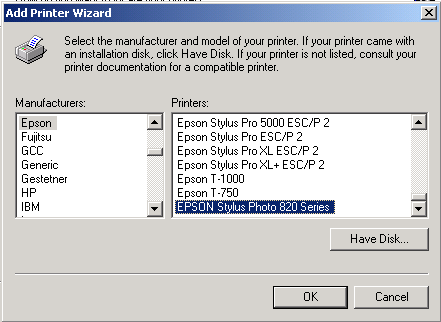 On the Windows computer, go to the printer control panel and choose to 'Add a New Printer'. Next, choose to give a URL. For the URL, type in the location of the printer: http://host_ip_address:631/printers/printer_name (where host_ip_address is the GNU/Linux server's IP address and printer_name is the name of the printer being connected to). After this, install the native printer drivers for your printer on the Windows computer. If the CUPS server is set up to use its own printer drivers, then you can just select a generic postscript printer for the Windows client(e.g. 'HP Color LaserJet 8500 PS' or 'Xerox DocuTech 135 PS2'). Then test the print setup by printing a test page. This makes this way more difficult to configure and thus sometimes also more error-prone, mostly due do authentication problems. Windows 7 has a built-in LPD server - using it will probably be the easiest approach as it does neither require an installation of Samba on the client nor heavy configuration on the server. It can be activated in the Control Panel under Programs -> Activate Windows functions in the section Print services. The printer must have shared activated in its properties. Use a share name without any special characters like spaces, commas, etc. Before adding the printer, you will most likely have to install an appropriate printer driver depending on your printer model. Generic PostScript or RAW drivers might also work. As above, IPP is also the preferred protocol for printer sharing. However this way might be a bit more difficult than the native Samba approach below, since you need a greater effort to set up an IPP-Server on Windows. The commonly chosen server software is Microsoft's Internet Information Services (IIS). A much simpler way is using Window's native printer sharing via Samba. There is almost no configuration needed, and all of it can be done from the CUPS Backend. As above noted, if there are any problems the reason is mostly related to authentication trouble and Windows access restrictions. On the server side enable sharing for your desired printer and ensure that the user on the client machine has the right to access the printer. The following section describes how to set up the client, assuming that both daemons (cupsd and smbd) are running. The Samba CUPS back-end is enabled by default, if for any reason it is not activate it by entering the following command and restarting CUPS. 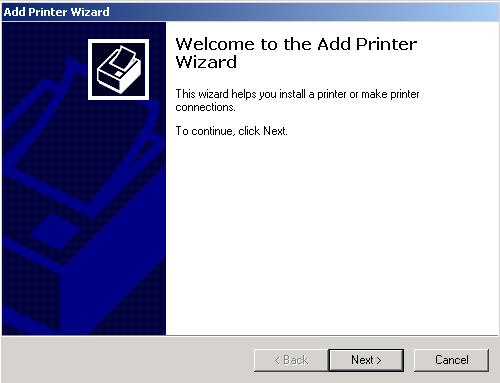 Next, simply log in on the CUPS web interface and choose to add a new printer. As a device choose "Windows Printer via SAMBA". If the network contains many printers you might want to set a preferred printer. To do so use the web interface, go into the printer tab, choose the desired printer and select 'Set as default' from the drop-down list. Then restart the CUPS daemon an try to print a test page. which keeps printing new error messages as the occur. Note: You can also use the web interface to browse this error file. 1. Install samba - Use yum to install samba for your Fedora release. 3. Configure iptables - Add following rules to your iptables to accept NETBIOS session service from Windows. 3) Type printer name as following. Make sure to substitute with your Linux IP address and Samba printer name. 4) You will see following message since there is no Windows printer driver on Linux. Click OK.
5) Select your model of your printer from following. You might need to install a printer driver from a CD came with the printer. 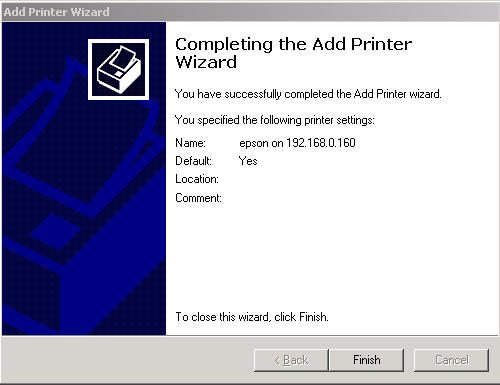 6) You've added printer driver successfully. 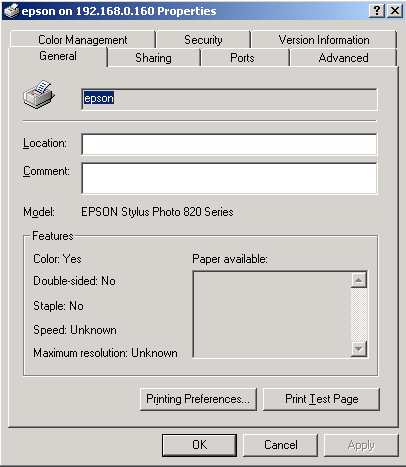 7) Now, print a test page from Windows to the printer which is attached to Linux box. How can I set up my printer from within Linux to be accessible from my Windows 7 pc? Step 1: Enable Sharing for that Printer. Menu > Administration > Printing > Server > Settings > Check "Publish Shared Printers connected to this system"
Nice blog & thanks for sharing this useful information with us. We offer 24*7 printer support services to the customers across the world. Our expert team provides assistance for wireless printer setup, so if you are facing setup issues you can call us at our toll free number +1-888-339-8933 . Thanks for the useful blog. Keep updating. The best selection of, thank you for work you have done. Your whole text is very useful. Also visit the HP Printer Helpline Number for getting more info about it.